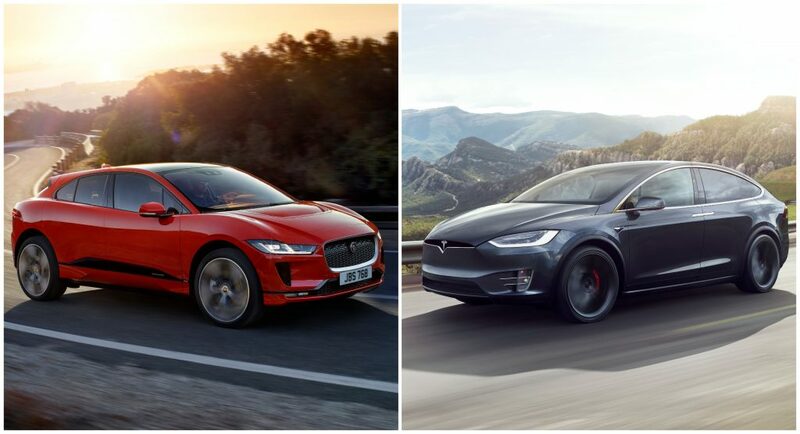 Jaguar I-Pace vs Tesla Model X: Which One Would You Drive To Your Home Charger? Finally someone has challenged Tesla and their monopoly of premium electric vehicles, and that someone is none other than Jaguar with the all-new I-Pace. Jaguar has become the first major manufacturer to officially enter the high-performance EV world (BMW’s i8 is a hybrid) and the I-Pace looks mighty impressive for what is basically their first take on the whole zero-emissions thing. The sculpted bodywork with its really short overhangs actually makes the I-Pace look more like an English bulldog rather than a wild feline. 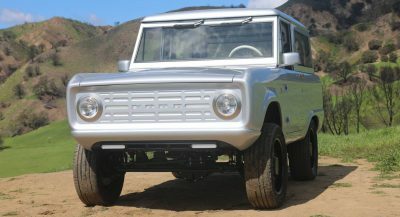 That in our books is a success, especially if you think that most other proposed premium electric SUVs look either like they escaped from a sci-fi film or like those normal, fossil fuel-sipping SUVs. Ian Callum took advantage of the electric powertrain’s compact packaging to give the I-Pace a really big interior for its size, with Jaguar even claiming that the rear passengers enjoy more legroom than the bigger Porsche Cayenne. With an overall length that essentially matches that of the XE saloon, the I-Pace indeed sounds like an impressive SUV, and not just because it’s powered by electricity. The Tesla Model X, on the other hand, is not the prettiest of the cars, but it’s definitely a striking vehicle because it looks different and futuristic. The rear gullwing doors certainly increase its wow factor, with bonus points for its many Easter eggs that involve silly things like flapping its doors like a sea gull and more clever ones, like summoning it from its parking spot. 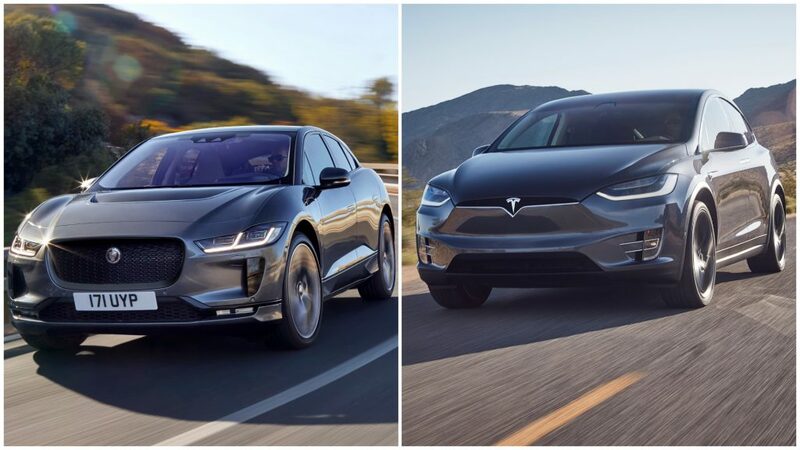 The two electric SUVs are seen as rivals, but the truth is that the Tesla is significantly bigger as well as available with seven seats, an option the Jaguar doesn’t have. The American model is also more expensive than the I-Pace, with the range-topping P100D costing almost double the money Jaguar asks for the base version of their EV, at least in Europe. Speaking of money, the Jaguar I-Pace is priced from £58,995 in the UK, including the government’s EV rebate, while the Tesla Model X 75D costs from £71,350. US pricing for the I-Pace will be announced after its public premiere at the Geneva Motor Show. But enough with the rambling, we’re here for one job and that is not to pit one against another in terms of performance, as Jaguar did yesterday, but to do a visual comparison between the two premium all-electric SUVs and decide which one we want the most. At the front, both models keep things familiar, with the I-Pace getting the signature Jaguar treatment and the Model X looking clean and minimalist, like all Teslas do. By the moment you start going around them, you instantly notice the Jag’s much lower roofline, which makes it look sportier than the Model X. The same goes around the back, with the I-Pace adopting sharp edges and slim taillights, whereas the Model X keeps it curvy but friendly. 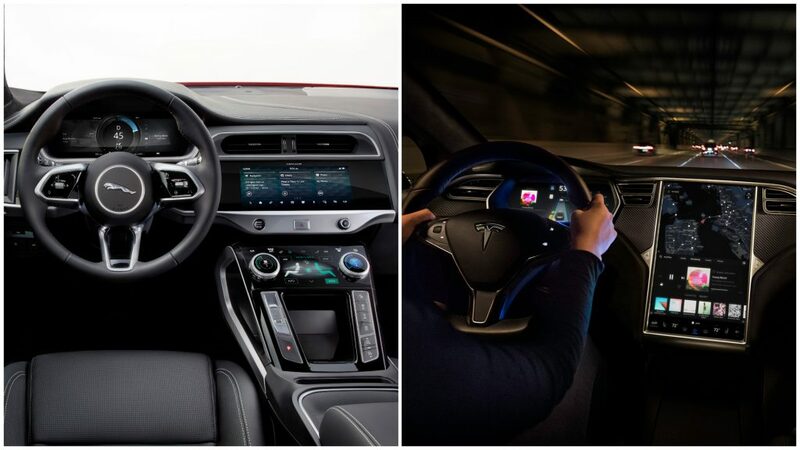 Both of their interiors look futuristic, with the Tesla offering simpler lines and that massive infotainment screen that controls everything and the Jaguar showing off a more sculpted dashboard and the company’s latest duo-display system. So, which one is your pick? Do you prefer your electric family hauler with a side of sportiness like the I-Pace, or is the clean and minimalist styling of the Model X more attractive to you? Go ahead and cast your vote now! The model s is pretty much garbage with bird doors. Tesla is going to get slaughtered if they don’t up their game, especially on fit finish and materials quality. Germans are going to run right over them. the european car image speaks for itself. the quality of interior design and the exterior can ruin tesla at this point on. Jaguar’s little touchscreen is nowhere close to Tesla’s industry leading 17 inch screen. And I prefer Tesla’s interior over Jags. Look at that, a differing opinion. tbh that tesla’s touchscreen is a distraction. it’s not good for driving. i prefer luxurious interior with a quite ride quality that the europeans can offer. don’t underestimate them. especially the germans. The Germans aren’t running anywhere without a fast charging network. Nice try. 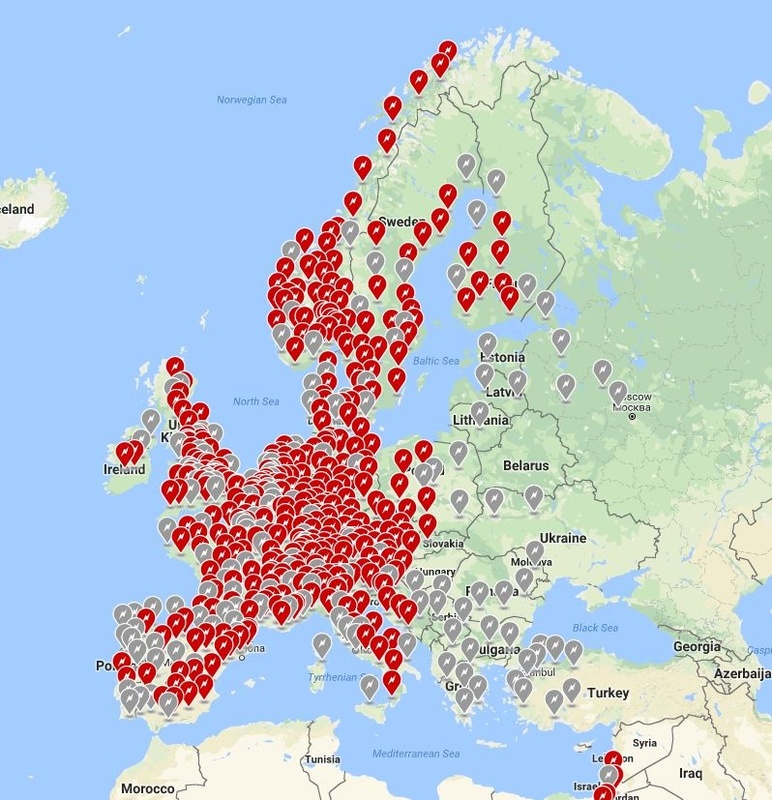 So where’s Tesla’s charging network outside of the US? I suggest you ask the French and Germans. They belong to different segment in terms of exterior/interior dimensions and pricepoint too so why should they be compared with each other? Pointless?? At 1560mm height, ipace is more of a crossover than an SUV for your info. Pointless comparison anyway! dude.. they’re similar. At this point in the game, this Jag is the only car, suv, crossover or whatever you’d like to call it, that is comparable to the Tesla Model X. Model X is larger and heavier than the I-Pace. ones a 5 seater, the other seats up to 7 people. think more an SUV people mover and an SUV. One is longer and weighs more than the other. akin to comparing the model S with an X5 – they’re both all wheel drive. How are you going to go long distance in the I-Pace in a reasonable amount of time? Tesla has the charging infrastructure. Jaguar does not. Essentially the I-Pace is just a toy, just how everyone said Tesla’s are toys. Only difference is the Tesla is a practical toy. I’ll take the Tesla with the Jag’s interiors and normal rear doors, thank you. I’ll take the I Pace thank you very much. This is not even a contest. It’s a slaughter. I didn’t say Tesla was doomed; they’ve just lost this particular pair-up in the court of public opinion. For me, I just don’t think their reasoning to avoid skeuomorphs has worked particularly well. The I-Pace has a skeuomorphic grill that looks like what you would expect on a car, whereas the front of the Model X looks like the bow of plastic flat-bottom boat. I’d take the I-Pace, even with Jaguar’s patchy reputation for quality and reliability. I would trust Jaguar quality more, and that interior seems miles better. Electric cars are finally taking off from big brands and there isn’t much advantage left in getting a Tesla anymore. Look forward to Porsche Mission E.
exactly. I was going to say that. Yes, the base is less expensive, however when you add the options, the price will climb immensely. The best thing is the innovative grill on the electric I-Pace. German engineering at its finest. And that puny touchscreen. Totally trumps Tesla’s 17 inch touchscreen. The sarcasm is off the charts. Didn’t Musk say he wanted Tesla to at least jump start the EV industry? That he wouldn’t care if Tesla went under in the long term? 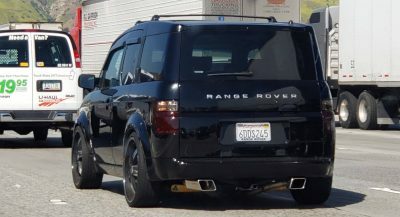 That grill is there to prevent the Jag from from looking like teh Model X’s plastic boat fascia. German? Jaguar is British in the hand of Indians. What part is German? Go hug your Tesla, because Tesla’s days are numbered. When Porsche Mission E comes to market, Tesla will be no more than a pile of dust. For now enjoy commenting here and insult anyone who is against Tesla. 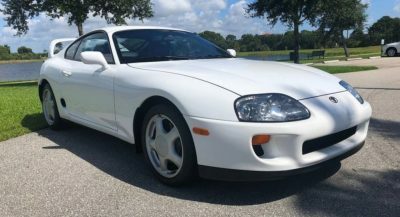 Once the major players start to make long range electric cars, I don’t see people opting for Teslas anymore, with their notorious reliability issues which makes Jaguars look well-made. You’re so right David. You owning and driving a Tesla everyday, you know all about it’s reliability from your first hand experience. Literally read all the reliability reports and see who tops the list every time. David Lee you can never argue with someone who is emotional about a brand. All you can do is say your peace and move on. good word of wisdom there. You clearly haven’t been in a Tesla. The new materials are actually really nice compared to the older Tesla’s. They’re still not that good though, condidering they used to be terrible. I agree on this.. the jag exterior doesn’t wow me.. but that interior is just wow!! True… the whole 7 seat option is overblown. I don’t know one person that actually shuttles 7 people around on a regular basis. 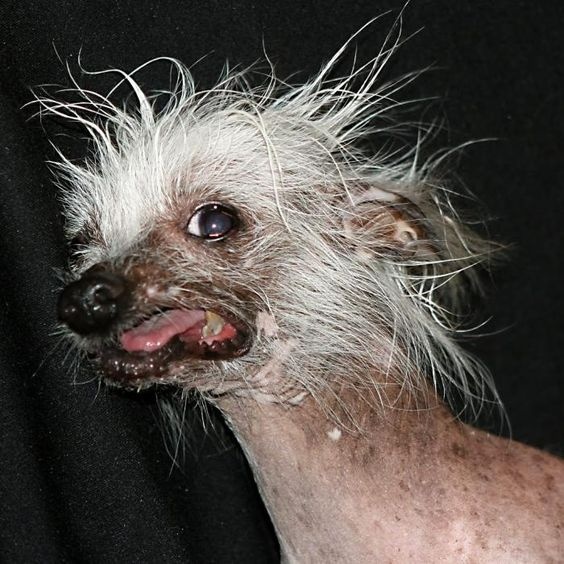 This is the Jag’s real canine inspiration. Can I get a “neither” option please? THE JAG IS NO DOUBT PRETTIER AND CAN BE EXTENSIVELY OPTIONED THE WAY BUYERS WANT. THE MODEL X IS A PUFFED UP (VISUALLY) VERSION OF THE MODEL S AND COULD NEVER BE CALLED PRETTY. THAT BEING SAID, THEY STILL HAVE TO ACTUALLY BUILD THEM AND GET THEM IN THE HANDS OF BUYERS. WILL THEY FIX PROBLEMS AS THE COME UP, SEND A TRUCK IF IT NEED PHYSICAL REPAIR OR UPDATE OVER THE AIR? Tesla is done for. The competition is coming strong. Man, even Volvo, they will destroy Tesla since there cars look amazing and have amazing interiors when they offer full electric. I sat in a Tesla and it feels like your sitting on a park bench. The cars inside also look and feel hard, stiff and cheap. The exterior just looks like a appliance with no design. It might still remain popular in America, but no where else. While I’m a fan of Tesla’s leading edge in innovative, the Jaguar looks more practical and less bothersome to use as an actual daily driver. I’d gladly take it home. 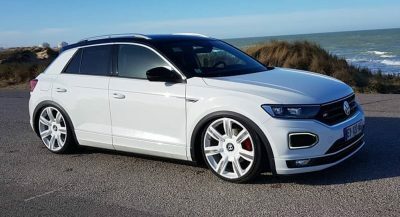 Nice try Jag but you had several years and the Model X still looks more futuristic. But the specs and price will be the real measure. I hope Jag really give Tesla some competition. They are completely different vehicles. Tesla available as 7 seater. Tesla has more wow. Just by exterior design, if somebody posted that the i-Pace was next gen Nero, I’d believe it. I haven’t driven either one but just by reputation I’d bet the Jag is more fun to drive. Also guessing the X would be more practical to live with. Previous PostPrevious Saudi Arabia To Sell Property Of Detained Billionaire – And His 923 Cars!